Corona Mac Park’s name is derived from two sources: the first part originates from the surrounding neighborhood of Corona, and the second half comes from the adjacent housing project which was funded by the Municipal Assistance Corporation (MAC). MAC is a New York City agency created in 1975 to oversee the city’s fiscal crisis and budget management. It functions as a public benefit corporation, and is authorized to issue its own debt securities, which are backed by revenues from sales tax, stock transfer tax, and per capita aid from the State, to fund projects such as the nearby housing project. Corona lies in north central Queens and adjoins Flushing Bay and Flushing Meadows-Corona Park. In 1854, a group of speculators from New York City developed the area and named it West Flushing, after the Flushing Remonstrance—a landmark document drafted by members of the Society of Friends (Quakers) in 1657 proclaiming religious freedom in America. The beginning of regional Long Island Rail Road service and the opening of the National Race Course also occurred in 1854. Developers planned the streets according to the railroad route, and settlement increased exponentially in the following years. In 1867, music publisher and land developer Benjamin W. Hitchcock (1827-1916) extended his influence into West Flushing by buying 1200 lots of land. He also saw to the opening of a Flushing Rail Road station at National Avenue. The town grew in population and importance, and, by 1872, the village decided upon a name it could claim its own. Corona, a Latin term for “crown,” was chosen because the town’s residents considered their home to be the “crown” of municipalities on Long Island. During the latter half of the 19th century, Corona became home to many factories, producing goods as varied as portable houses, fine china, and Tiffany glass. In 1856, the National Race Course was reopened as the Fashion Race Track. The track, renamed for a horse, operated until its closing 10 years later. Corona’s population had reached 2,500 by 1898 and 6,200 by 1910; the introduction of rapid transit in 1917 spurred further population growth. Corona was the site of heated conflicts between middle-class homeowners and advocates of low-income housing during the administration of Mayor John V. Lindsay (1921-2001). These conflicts were resolved in part through the leadership of a local attorney who would later become Governor of New York State, Mario Cuomo. It also has another claim to fame. From 1943 to 1971, the great jazz trumpeter Louis Armstrong (1901-1971) lived in the neighborhood. At that time, Corona was home to a predominantly Italian and Jewish population. Since World War II, the neighborhood has felt a huge influx of Latin American immigrants. In the 1980s, the community saw another heavy wave of immigrants, who now make up the largely Dominican, Puerto Rican, Chinese and Colombian population. Their presence adds to the broad ethnic diversity of the neighborhood. Parks received this property, located on Lewis Avenue between 101st and 102nd Streets, from the City in 1997. 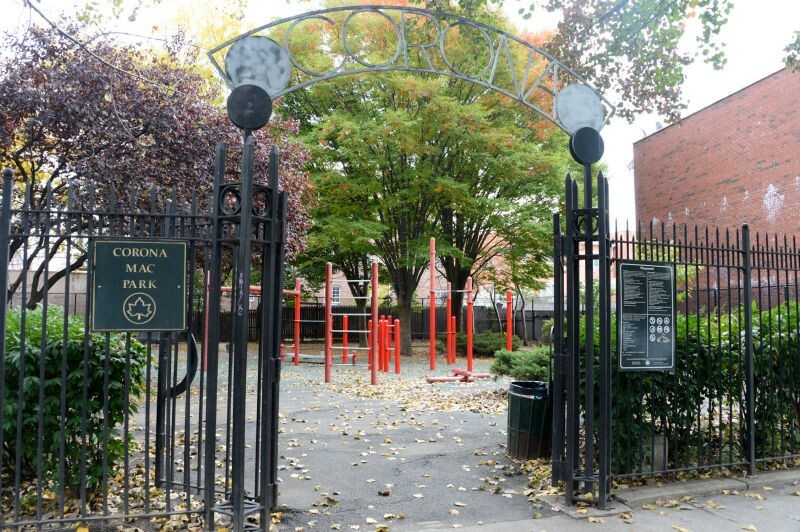 Corona Mac Park used to be part of HPD’s “Permanent Open Space Program,” which enabled local civic organizations to become involved in neighborhood park maintenance and thereby have a direct influence on the well-being and beauty of their community. 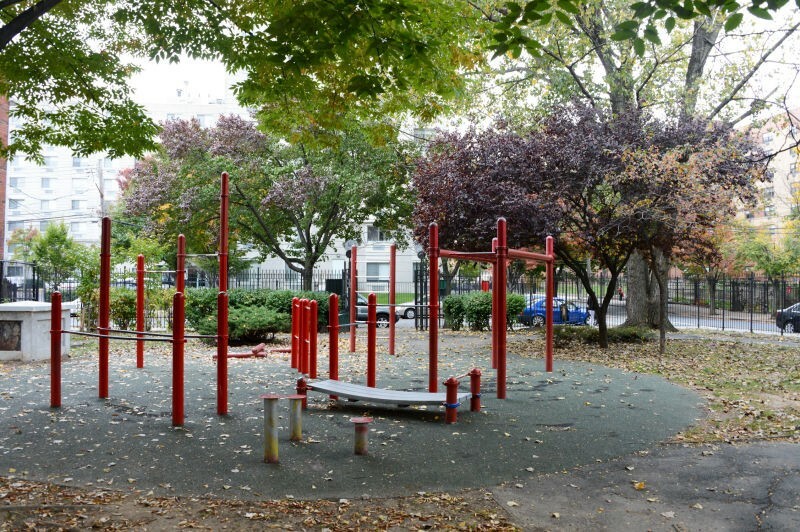 Corona Mac Park offers visitors a quiet sitting area with shaded benches, as well as colorful play equipment with safety surfacing.